The rise of the asylum is shrouded in mystery and uncertainty, and, in the absence of facts, the Romantics obsessed over wrongful institutionalization, but the bureaucracy that handled the treatment of the insane is more tangible than most people might expect. Culturally speaking, the Romantics represented, among other competing ideologies, the shifting realities for what individuals could feasibly expect in exchange for their time and effort in labor markets. These markets were driven by national and industry agendas where people who were unable to work were often forced into institutions and then labeled insane. In France, there were significant improvements in psychiatric treatment over what had been happening in England. However, because England lagged behind in dealing with disenfranchised populations, grass root tensions forced legislative changes in the way asylums were being operated. These laws shaped the cultural movement toward the creation of the medical case study. The medical case study was used to regulate communities viewed through the shifting nineteenth century context of mental illness. Susan G. Wells traces the backgrounds of its development back to the mid-nineteenth century in her article, “Freud’s Rat Man and the Medical Case Study: Genre in Three Keys,” and she makes a strong case for how nineteenth century readers forward have read medical case studies in the context of literature (Literary History, 2003). One only has to look to Freud’s Dora for proof of this point, but the medical case study predates Freud by 75 years or so and can be examined within the context of the French Romantic artist, Jean-Louis André Théodore Géricault’s “Portraits of the Insane.” Géricault’s paintings were commissioned by his doctor as therapy, but they were then included in patients’ medical case files as supporting documentation for diagnoses of “monomania,” a general term which describes a person with a single, driving obsession. Although the Romantics were fascinated with melancholy, suicide, and focused introspection, part of the problem in identifying mainstream Romantic ideologies is there seems to be no unifying focus. While these qualities are most often acknowledged in Shelley’s Frankenstein, unreliable narrators serve as voices in Hogg’s Private Memoirs and Confessions of a Justified Sinner, Tennyson’s “Maud,” Browning’s “Porphyria’s Lover” and The Ring and the Book, and Stevenson’s Jekyll and Hyde, so even if it is difficult to point to one identifying feature operating within the nineteenth century, the unreliable narrative voice appears in a variety of genres where it was used to articulate what was increasingly becoming the Romantic preoccupation with insanity and the associated practice of documenting the treatment of individuals in asylums, which is where the interdisciplinary connection between literature and medicine, in the form of the medical case study, enters the conversation. That said, urban legends regarding the unfair treatment of the insane grew out of control in a time when anyone, regardless of gender or social standing, could be locked away based upon the testimony of a relative or a self-declared medical professional, such as Mrs. Rebecca Batt, widow of Edward Batt and the proprietor and resident superintendent of the private house at Witney, Oxfordshire, England, from 1827 to 1842. William Parry-Jones claims in The Trade in Lunacy there is no written evidence for either of the Batts having received any formal medical training, but this did not prevent Mrs. Batt from issuing “Medical Certificates” in accordance with the Madhouse Act of 1828. While these documents do at least form a written record for patients admitted into the asylum system, which, up to this point, had been largely absent, Mrs. Batt was operating far afield of the law’s original intent, which was to verify a person’s need for treatment based upon a thorough examination by medical personnel at the time of patient admittance. Over filled private houses such as Witney and others, such as those in Hoxton (London), created a growing social anxiety regarding forced treatment where record keeping, when in existence, was minimal although, by 1832, patient records did include patient names, signatures of admitting personnel, declarations of lunacy, and, rather surprisingly, caricatures of patients. Diagnoses were largely absent, except as in the case of Géricault and others like him who were diagnosed very generally as monomaniacs, for example, but these were early days in the field of psychiatry. Because patient caricatures were a prominent feature of the emerging medical case study, I would like to return to Géricault’s personal situation for just a moment. It is unclear exactly when he painted his asylum colleagues, but it is generally thought that during the latter of his two mental breakdowns, his attending physician, Doctor Étienne-Jean Gorget, who worked both at the Pitié-Salpêtrière teaching hospital in Paris and the private asylum in Livry, prescribed he paint as therapy. 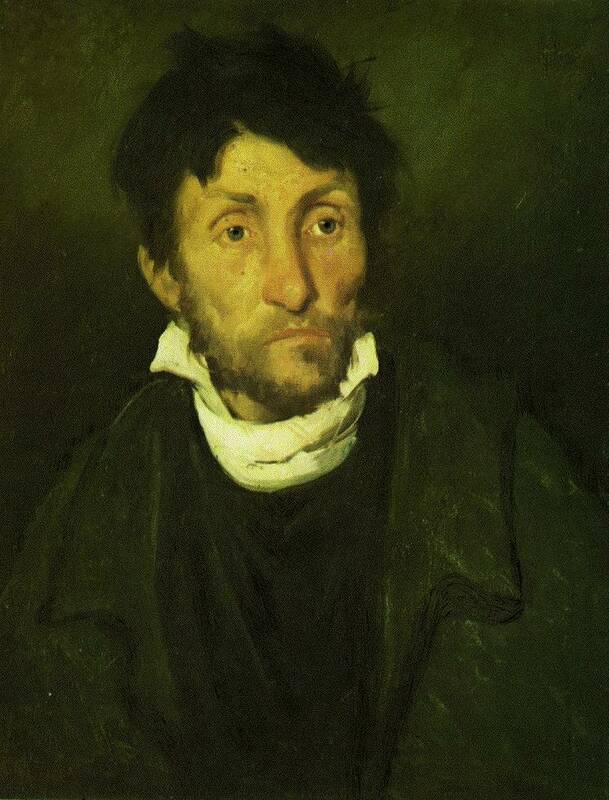 Géricault had suffered a mental breakdown, and he was definitely a workaholic whose life was out of control, especially after having undertaken a tour of England in 1819. This was a working trip showcasing The Raft of the Medusa, an oil depicting a small group of survivors abandoned at sea after the wreck of a French frigate in 1816. Also, a back injury he had sustained had never properly healed, and it may have contributed to his death at the age of 32. Even so, his work record speaks for itself as he was classically trained, a relentless researcher, and artistically gifted, and his paintings up until his institutionalization depicted subjects of great historical and social significance. Imagine lying in bed at night wondering if, at any moment, without prior warning and perhaps without proper cause or recourse, you might be spirited away and incarcerated against your will based upon the authority of the wife of the surgeon who is also the caretaker of the asylum. The attending physician, by the way, can verify none of his training, and the school from which he claims to have received his training bears no record of his matriculation. In fact, if there is no physician on the floor when you arrive, the housekeeper might actually issue the necessary paperwork. The diagnosis you receive might be suspect, but the certificate used for admittance will be legal and, therefore, binding. While this system was obviously rife with problems, it was a definite improvement over the absence of any formal documentation in the warehousing of asylum inmates. In addition, within the medical case study, there lies a narrative function. Ideally, a medical case study represents a particular person whose pertinent information is unique. During the nineteenth century, medical case studies as a new rhetorical form often misused bureaucratic forms, recorded invalid signatures, and included unqualified eye witness accounts of patient behaviors in the diagnoses of mental illness. At the same time, the historical record indicates the converging influences of literature and art onto the politics of the developing field of psychiatry. Further, the history of the medical case study provides a tangible document mirroring much of the defining literature and art produced during the nineteenth century which employs the unreliable narrative voice as a substitute for an informed, credible perspective. The condition of mental institutions, the nature of madness, and the questionable validity of evidentiary documentation, fostered this unstable voice, and it is still very much with us today. Dr. Kimberly Downing Robinson is an Associate Professor at the University of Arkansas – Fort Smith where her teaching duties are divided between the rhetoric and literature programs. Her research interests include rare book collecting, bibliography, art history, assessment methodologies, and pedagogical innovation. Her recent interdisciplinary collaborative course design, “Thrift as an Ideology,” can be viewed here. It is chilling to read how easily (and perhaps often) a person could be labeled as “mentally ill” and sent to an asylum. Wouldn’t living in such a world drive someone almost insane? Very informative and thought-provoking post. I was thinking that too. But it also made me think that perhaps the same thing is happening now, just that asylums have been replaced by prescription medication? Indeed. Rather than questioning our own judgment of people who think/feel differently, we offer them drugs so they can conform to our society’s expectations. Thank you for your comments and for reblogging my post! We haven’t come all that far really, have we? The fear of wrongful institutionalization has been a defining factor for centuries and is very much with us today. Hi! I’ve wondered about that, too. What I found in researching this topic is that, many times, those who refused to go with the flow found themselves being forced to comply. Is it so different today? Really enjoyed the perspective here. I found Charlotte Perkins Gilman’s The Yellow Wallpaper to be a terrifying short story about the blurry line between insanity and feeling haunted. I read a lot of 19th-century short stories for my blog. Women writers were especially keen on this subject, I think. Thank you for this. The Yellow Wallpaper is one of my favorite stories! Have you seen The Portraits of the Insane: The Case of Dr. Diamond? Dr. Diamond was an early nineteenth century photographer, and this book is comprised of his photos taken of those living in institutions similar to what Géricault had produced on canvas. Interesting post on the development of the “medical case study,” but also a chilling look at “mental illness” in the 19th Century. Great post – I’m reading Foucault’s Madness and Civilization at the moment – a fascinating insight to the treatment of ‘mental illness’ and the (industrial) origins of incarceration. Although we don’t quite gape as once we might have at people afflicted with mental illness – it’s still an intriguing component of society. I’m quite drawn to that rather strange other world – the split between what is ‘reasonable’ by society and what is not and therefore treated in a particular way. I agree with Irene – there is probably a modern version of this through a different type of diagnosis, a change of language and drug therapy. I think Irene’s right, too. Foucault’s discussion of the industrial origins of incarceration figure significantly in this conversation, but another text you might enjoy reading is Arthur D. Morris’s study of The Hoxton Madhouses (Cambridge: Goodwin, 1958). Fascinating stuff! Thanks Kimberly for that suggestion to hunt down some more reading. I enjoyed the Surgeon of Crowthorne – which was an amazing story about a truly Victorian intersection of madness and scholarship – so awful and wonderful all at once. Your opening sentence is wrong. The history of poor houses and asylums in Britain is well documented,and the Romantics knew about them. The Romantics were artists and writers of fiction, not historians. There is a difference. And England did not lag behind in dealing with disenfranchised populations, only some of whom had mental health problems. Some of them were sent to America. As were the poor from many other European nations. I couldn’t agree with you more that “misfits” were being removed from their familiar settings and being sent away either to asylums or to other countries, These practices for dealing with disenfranchised populations fostered the general social unrest and anxiety which is mirrored in much of the literature and art from the period. Thank you for your comment. This is not very far removed from today’s mental health reality, this actually still happens today my dear…. This is the stuff of nightmares! I have to agree with you though I wish it were not so. Honestly, I don’t see Géricault’s personal situation as much different from what happens today to people who are unable to function in 21st century society. Recalling Rousseau men are born every where free but chained to their past. However much you may fight sanity society created and as existing before disenfranchises you wrongfully. for many reasons and not for sanity that you may command. The lady who accused Bertie of seducing her is put away in asylum to save family honor and philandering King in waiting. Camille Claudel similarly was put away since Rodin’s name and art was more in keeping with mood of the times. An artist strength is in ability to create despite the terror of being committed to an institution but it is a very fragile thread and too much cof pressure can snap it. Work as a therapy only unto a point and as much as the writer or artist feels t in bones the terror could be used as a catalyst. Poe’s stories might serve as a example. Interesting article. It is really frightening when you think how open such a system (if “system” it can be called) was open to abuse. How easy it would have been for unscrupulous relatives, in collusion with “doctors” motivated by greed, to dispose of inconvenient relatives in order to the control of their wealth. No wonder the subject was so popular with Gothic novelists! Reblogged this on Song of Mist.